Leipsic’s Hayley Heitmeyer hits a spike against Lima Central Catholic’s Kennedy Parker, left, and Hannah Riepenhoff during Thursday night’s Division IV district final at Ottawa-Glandorf’s Robert J. Hermiller Gymnasium. See more volleyball photos at LimaScores.com. 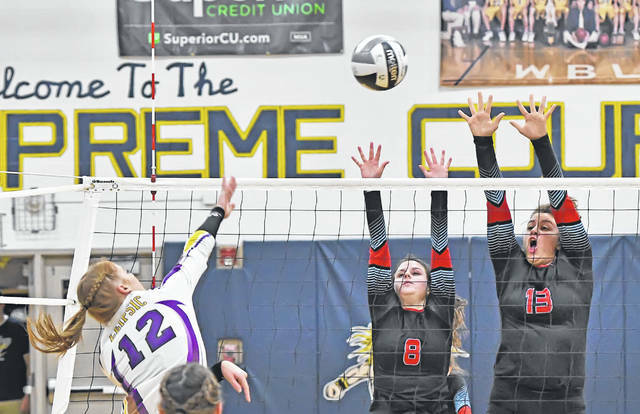 Lima Central Catholic’s Rosie Williams hits a spike against Leipsic’s Liz Sheckelhoff, left, and Peyton Heitmeyer during Thursday’s night’s Division IV district final at Ottawa-Glandorf’s Robert J. Hermiller Gymnasium. Leipsic’s Brooke Brown hits a spike against Lima Central Catholic’s Hannah Riepenhoff (8) and Rosie Williams during Thursday’s night’s Division IV district final at Ottawa-Glandorf’s Robert J. Hermiller Gymnasium. 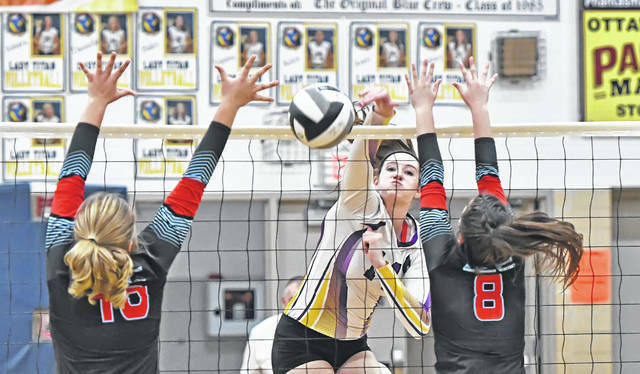 OTTAWA — Leipsic has swept every opponent it has faced throughout this postseason volleyball tournament. Lima Central Catholic was hoping to change all that in Thursday night’s Division IV district final matchup at Ottawa-Glandorf’s Robert J. Hermiller Gymnasium. LCC gave Leipsic a battle in the second set and the early part of the third set. However, the Vikings’ front line proved to be too strong to overcome, as Leipsic won in straight sets – 25-8, 25-22 and 25-10. Leipsic (24-2) advances to the Elida regional where the Vikings will play in a 6 p.m. Thursday semifinal against Findlay district winner Arlington. 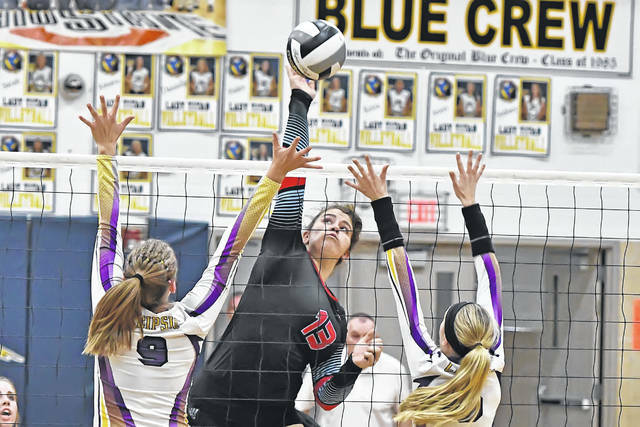 After Leipsic dominated Thursday’s first set, LCC (15-11) came back in the second set and gave the Vikings everything they could handle. In the second set, there were five lead changes and the score was knotted five times, before Leipsic battled back from a five-point deficit and won by three points. Hayley Heitmeyer and Elizabeth Scheckelhoff led the way for the Vikings with five kills each in the hard-fought second set. Heitmeyer was tough to handle near the net. On the night, Heitmeyer recorded 22 kills and had three blocks. She also served up three aces. Early in the third set, LCC knotted the score four times, before Leipsic got into a groove and finally took the game over. Heitmeyer got busy in the final set, recording seven kills. Heitmeyer had a lot of support Thursday night. Carlee Siefker had eight kills, 15 digs and three aces. Selena Loredo had 21 assists and three aces. Kacey Dulle had 13 digs. Elizabeth Scheckelhoff added seven kills for the Vikings. “The first set, we kind of played our game,” Heitmeyer said. “We came out on fire. Then that second set, I think we just got in our heads that we thought it was going to be easy, because we beat them in the first set so bad. Rosie Williams led the T-Birds with seven kills. Makenna Mohler served up three aces. Jocelyn Morrisey recorded 14 digs. Hannah Riepenhoff had 12 assists for LCC. “I think the second set was a key set,” LCC coach Wes Horstman said. “They fired away at us in the first set. We relaxed a little bit and came out hard in that second set and did a really nice job. The Leipsic program has been working for this opportunity for quite some time. This entry was tagged leipsic, limacentralcatholic. Bookmark the permalink.